Experiencing Hearing Loss ? Try These Communication Tips. Experiencing Hearing Loss? Try These Communication Tips. 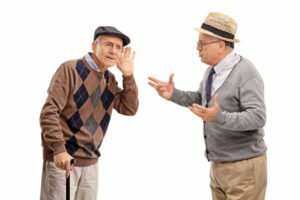 Background noises, fast talkers and those who mumble — these factors and others make it very difficult for those with hearing problems to participate in group discussions, and may even cause them to be left out altogether. People without hearing loss must recognize this challenge and remember to speak clearly and slowly, always facing the senior. Tell the individuals you’re with that you are experiencing hearing loss, so they know to modify their speech, face you when they’re talking, or make other accommodations to help keep you in the dialogue. Sit or stand where you can see the faces of all speakers. Move away from noise or other background disruptions. Use what you already know about the person speaking to help provide clues on what is going on in the conversation, including the individual’s interests or habits. Stay educated about current events. Make certain that you are well-rested before participating in an occasion where you will be listening to a lot of conversation. Friendly, nurturing companionship to participate in favorite activities and hobbies, conversations, taking walks together, etc. Personal care such as help with bathing, dressing, hygiene, ambulation and transfers, etc. Connect with us at (866) 940-4343 to arrange for a free in-home meeting and to take the first step in improving quality of life for your senior loved one in California.